Here we are at the end of another season which seems to have passed in a flash, no time at all since we were preparing the fleet for Easter. It’s been a busy season, with four new Elite boats being added to the fleet, 2 of the 28’6 Brinks Encores and 2 of the 39′ Brinks Serenades and of course the 9 additional boats we bought from Royalls boatyard. In September we added 3 new self catering properties ‘The River Views‘, which are situated in our marina opposite the boatyard and ideal if you want a really quiet holiday. some much needed additional moorings for private boats too. If you would like information on our private moorings in Wroxham, please contact Kerry who will be happy to help. In September we said ‘goodbye’ to Margaret our Office Manager who had worked in the office for many years, she has now retired and is looking forward to spending time in her caravan on the coast – we all wish her a Happy Retirement. Sheila Scott who was our Senior Administrator has now taken the position on Office Manager, working with Karen who many of you will already know and our new bookings assistant Donna. is your point of contact if you have any suggestions on how we can improve your Norfolk Broads holiday. We are offering a 15% discount on all self catering holidays taken from now until the 21st December ’17. Why not come to Wroxham to do your Christmas shopping at Roys – everything you need in one place with no hassle parking! You could do a spot of fishing, the Pike are biting with fishermen reporting some good catches already this year. All of our properties have direct access to the river, so you can fish without having to go anywhere. Or of course you could choose to do absolutely nothing, just relax and put your feet up and enjoy the Norfolk Broads during the quietest time. All of our properties are available for weekly or short breaks and a Day Boat included in the cost of your booking for the duration of your stay. Are you thinking of doing something different this year for Christmas or New Year? When you book your seasonal self catering break with us, we will have a delicious Hamper of locally sourced food & treats, a bottle of Bubbly and decorated Christmas Tree ready for you on arrival. We have properties for families and groups of all sizes, from cosy 2 bed to our interlinking Daisy Broad Lodges which will sleep up to 20 people in total. Included in the price of your holiday or short break is a FREE DAY BOAT for the duration of your stay! Thank you very much to everyone who took part in this years photography competition, we had some beautiful entries and it was so hard to choose but we had to, and the winning entries can be seen in our new 2018 brochure. The winners all received vouchers for £150 to put towards their next holiday – we look forward to seeing you again soon. You can view all entries in this years photography competition in our Online Customer Album. To request a copy of next years brochure, either give us a call on 01603 782625 or complete our online form – either way, we’ll soon have one on it’s way to you. Save 5% on our brochure price for all 2018 bookings made before 28th February ’18. Save 20% On Midweek Short Breaks On Boating Holidays. Book a midweek break and get a 20% discount on breaks from from 16th April until 22nd May 2018. 2 Week Holiday – ‘Super Saver’ – Book a 2 week holiday and save 15% on the lowest priced week. Applies to both boating holidays & self catering. For holidays booked and paid for direct on our website, you will enjoy an additional £10 discount over telephone bookings. Our Customer Loyalty Scheme is really popular with our returning guests. If you have previously holidayed with us in the past 4 years, and rebook with us direct, you will receive a delicious local food Hamper supplied by Tavern Tasty. This will be delivered direct to the boatyard prior to your arrival for the start of your holiday. When booking, if you have moved house or your previous booking was with family and friends under a different name, please advise us so that we can make sure you get the Hamper you are entitled to on arrival. We love to see your holiday photographs, if you’ve had a great time and would like to share your pictures with us, email them to kerry@barnesbrinkcraft.com or add them to our Facebook & Twitter pages. A few weeks ago we purchased the ex Alpha Craft fleet from Brundall. If you are interested in purchasing an ex-hire boat, please take a look at our sister company website Norfolk Boat Sales. We have some great offers on our self catering accommodation over the February half term week, with 3 or 4 night short breaks from just £404 or a week from just £560. Each property has the use of a Dayboat free of charge for the duration of your stay, and remember if you have booked with us before you will receive a delicious Hamper full of locally produced treats! There’s lots going on in the area during half term, take a look at our Blog for some ideas on how to keep the whole family happy. Brinks Serenade is one of our our new cruisers for the 2017 season. 39′ Long, with 4+2 berths, modern & stylish lines combined with a very comfortable interior and the the latest technology, we are sure this boat will be prove to be very popular with families and couples alike. Both boats are now available to book via our website. During January, we were pleased to announce that we had bought neighbouring boatyard ‘Royalls’ after the retirement of Nigel & Sara Royall at the end of last season. The nine cruisers will be incorporated into our fleet and we are pleased to be honouring all holidays that have been pre-booked by Royalls. If you were a Royalls customer previously and have any questions or require further information, please do not hesitate to give us a call. We all wish Nigel & Sara a happy retirement which I am sure you will agree is well earnt after more than 50 years providing holidays on the Norfolk Broads. Save 5% on our brochure price for 2016 bookings made before 29th February ’17. Book a midweek break and get a 20% discount on breaks from from 11th April until 24th May 2017. 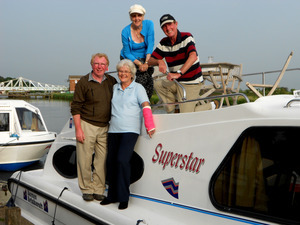 2 Week Boating Holiday – ‘Super Saver’ – Book a 2 week holiday and save 15% on the lowest priced week. Please see our ‘Offers’ page on the website for all currents offers & late availability. At last, Spring has arrived on the Broads and as we are writing our newsletter the sun is out and the sky is clear, it’s a really beautiful day. The Bank Holiday is just around the corner and it looks as if the good weather is going to continue so we can all enjoy the sunshine. We do have lots to tell you this month, so grab a coffee and sit back for a good read! It’s not too late to get away, so if you haven’t yet made plans for the weekend, we do still have limited availability on our Cruiser Hire. We have discounted our few remaining boats by 25% on normal tariff prices – so make the most of the long weekend and get out on the water. We are pleased to announce our new Customer Loyalty Scheme which will start on the weekend of 3rd May. All customers who have previously holidayed with us in the past 4 years, and who rebook with us direct, will receive a delicious local food Hamper supplied by Farm to Fork. This will be delivered direct to the boatyard prior to your arrival for the start of your holiday. Hamper includes:- Small loaf, butter, free range eggs, bacon, ham, seasonal fruit and chocolate brownies. Hamper includes:- Large loaf, butter, free range eggs, bacon, chipolata sausages, ham, mushrooms, vine tomatoes, salad leaves, salad dressing, seasonal fruit, local apple juice and chocolate brownies. If you have any queries regarding the new Loyalty Scheme, please contact Mags on 01603 782625 who will be happy to help. These discounts cannot be used in conjunction with any other offers and of course are subject to availability. We know it’s tempting to leave it until the last minute but with the good weather forecast to continue – don’t leave it too late and miss out! Call our booking office on 01603 782625 to make your booking, these discounts cannot be applied online. Have you taken a look inside our ‘Bosuns Locker‘? With the help of local suppliers we have put together some delicious treats which can be delivered free of charge to the boatyard prior to your arrival. Hampers are full of locally sourced foods, carefully selected wines and celebration items including mouth watering Sponge cakes from our friends at ‘Sponge’ who are offering Barnes Brinkcraft customers 10% discount on orders until the end of May. Our day boat office will open all over the Bank Holiday weekend and because of the weather forecast we are expecting to be really busy. Don’t be disappointed, give Ian a call and reserve your boat 01603 782625 – option 2. Don’t forget you can enjoy a quiet 2 hour early morning cruise from 8.30am-10.30am or an early evening cruise from 6pm-8pm for just £20. 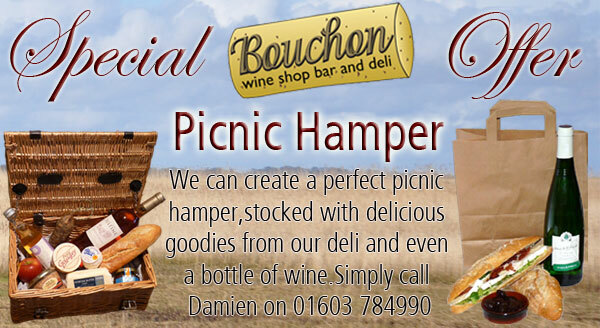 Local business ‘Bouchon’ can put together a delicious picnic for you from their deli, even providing the wine if you like – just give them a call on 01603 784990. On the 28th August Sarah Thwaites will be cycling 300 miles in 4 days (London – Brussels) to raise money for MNDA (Motor Neurone Disease Association). This is a very worthy cause and Barnes Brinkcraft will be supporting her, if you are able to help by sponsoring Sara, please visit her fundraising page where you can make an online donation. Sara Thwaites is raising money for MNDA (motor neurone disease association) by cycling 110 miles from London to Brussells – via the North Sea ferry. Also to raise money for the charity a Quiz Night is being held in Neatishead Village Hall on Saturday 8th June at 7.00pm. Tickets are £8 each and include chilli con carne/veggie chilli. Come along individually or make up a table of 6. Raffle prizes are also needed! An Early Christmas Present ! The discounts apply to holidays taken between the 27th July and 31st August 2013. Simply book your summer holiday by the 28th February 2013 to take advantage of these discounts. Brinks Omega Sleeps 2+2, stylish cruiser with large aft cockpit which is perfect for al fresco dining or fishing. Please call our booking line on 01603 782625 to get this discount applied to your holiday booking! Discounts apply to new bookings only. Rivers View is a self catering apartment within our Boathouse which has been built to a nautical theme and equipped to the highest standard. Rivers View can sleep up to four people in two bedrooms, each with their own en-suite and their own private access out onto the lower sun-deck. This property is perfect for families or for two couples sharing. Designed in an’ upside down’ style, the open plan living area is on the first floor, with patio doors leading to a furnished glass-sided balcony, providing lovely views out over the water. Perfect for relaxing and soaking up the atmosphere. For further details on these properties please contact a member of our reception team on 01603 782625. We are delighted to have won the award for ‘Exceptional Quality & Outstanding Customer Service’ at this weeks Blakes & Hoseasons AGM. Barnes Brinkcraft were also presented with an award for 40 years of Partnership Excellence.